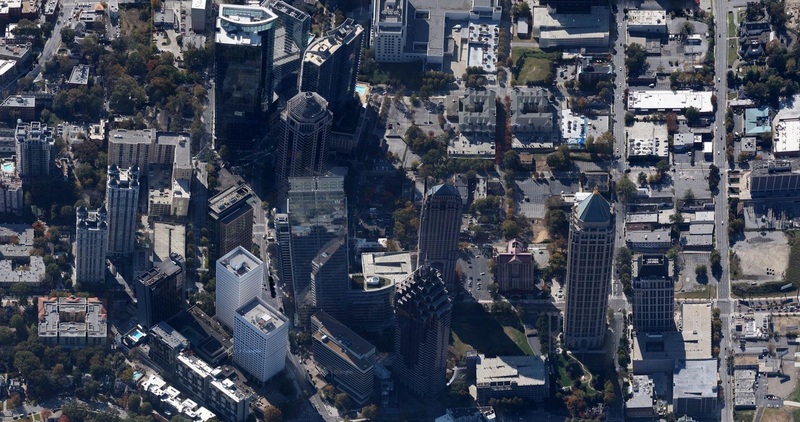 A massive mixed-use project that could add 3 skyscrapers to Midtown Atlanta — including one that could be Atlanta’s tallest tower at 60 stories— is moving forward. 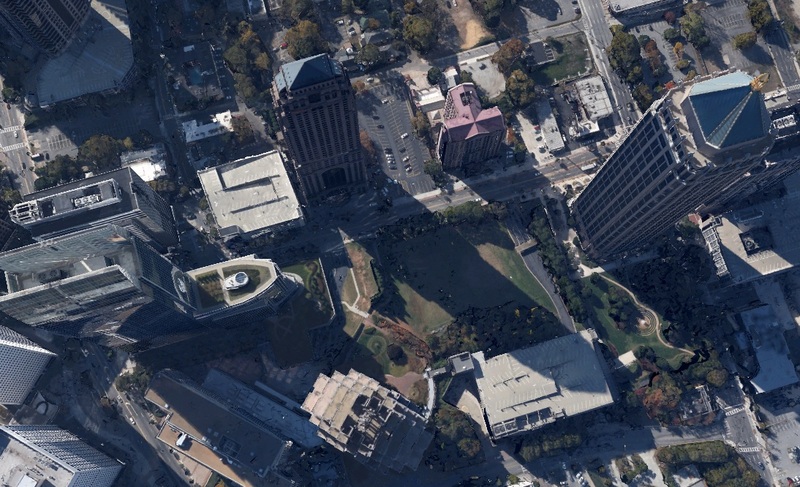 On Feb. 5, 2014 plans were formally filed in Atlanta for Midtown’s long-vacant “symphony center” site at 98 14th Street. 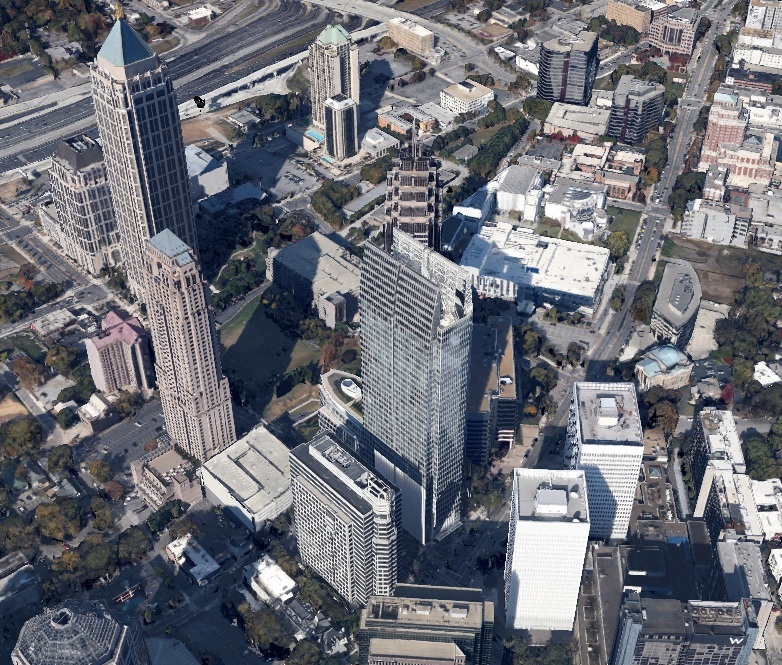 The 4.5-acre site is sandwiched between the 50-story One Atlantic Center and the 41-story 1180 Peachtree tower. 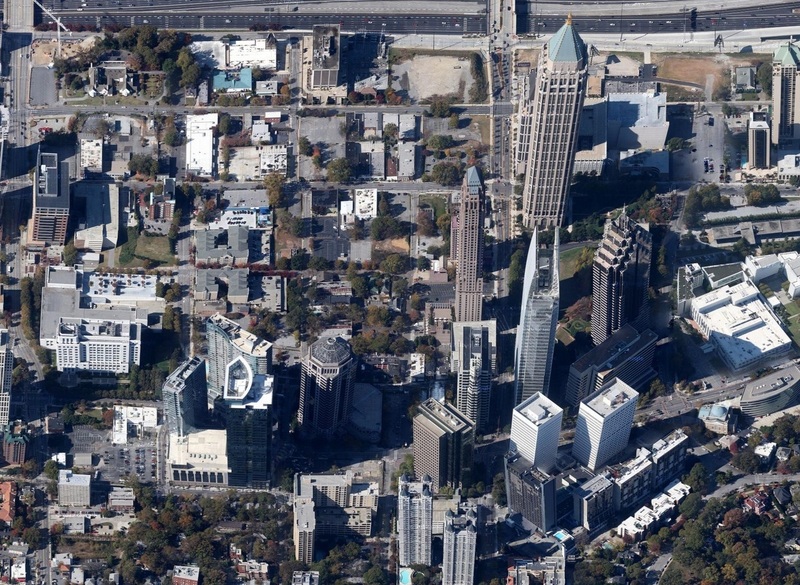 Atlanta Business Chronicle reported last November that a team including New York-based Ashkenazy Acquisition Corp. and international design firm Arquitectonica were proposing a nearly 2 million-square-foot development with three towers. One tower could soar to 60 stories, including about 300 residential units and a 340-room hotel. Midtown’s Bank of America Plaza, with its 23-karat, gold-leafed spire, is now the tallest building on the skyline at 55 stories. Another residential tower with frontage along 14th Street would be 57 stories. And the third tower near the Promenade II building would have 39 stories. In total, the project could include 90,000 square feet of shops and restaurants, 1,300 apartments, 340 hotel rooms and about 1,500 parking spaces. The symphony center site several years ago was going to house a new $300 million Atlanta Symphony Orchestra concert hall designed by Spanish architect Santiago Calatrava. About $100 million in private dollars were raised for the project, but an anticipated $100 million in state and local funding didn’t come through. 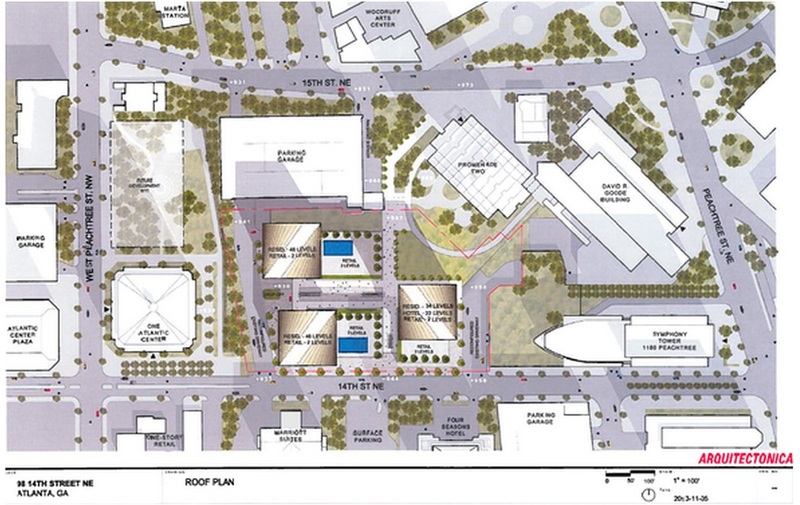 The Woodruff Arts Center now wants to build a new symphony hall at the corner of 15th and Peachtree streets. Click images below to enlarge. Click your back arrow to return to Dilemma X article. The tallest, dubbed Tower C, would soar 60 stories and contain 300 residential units and a hotel. 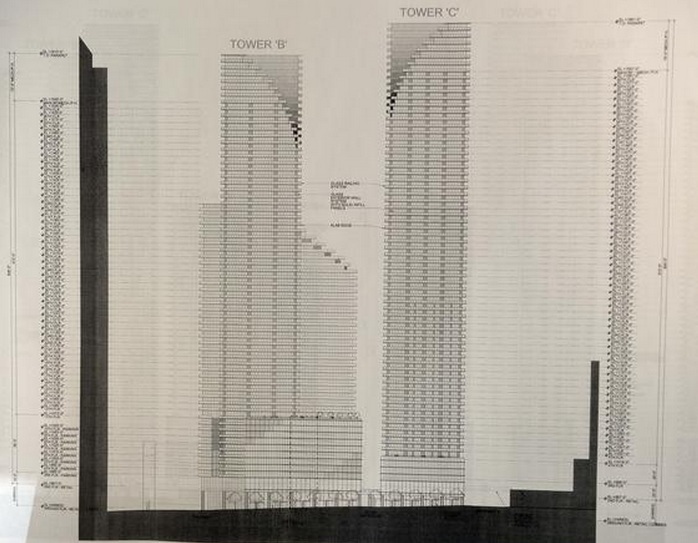 Tower B would have 57 stories and up to 500 residential units. Tower A would have 39 stories and up to 500 units. The development team includes Olympia Heights Management LLC and international design firm Arquitectonica. The development would be built in phases with completion set for 2020. 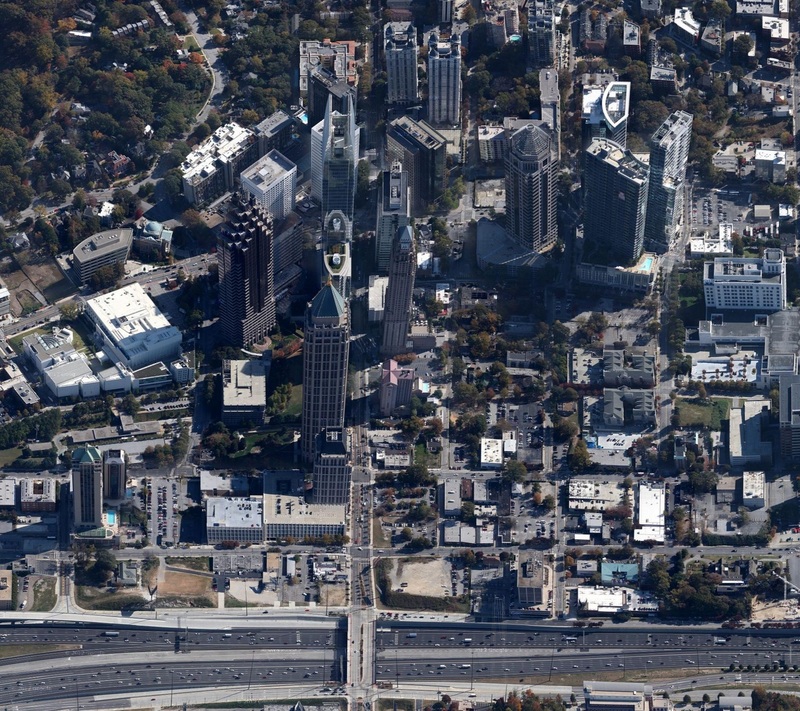 Midtown is part of the central business district in the city of Atlanta. It is located just north of Downtown.